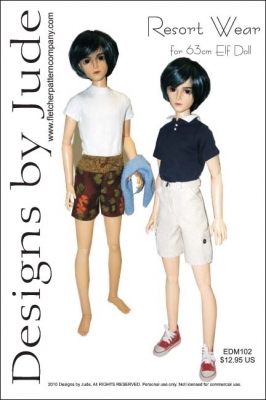 Clothing pattern to fit 63cm Elf Doll K Male. The pattern includes a classic short sleeve polo shirt, knee length cargo shorts, swim trunks and a short sleeve tee shirt. Pattern has been designed to be use with tee shirt cotton knits, knit blends, light weight linen, batik or similar fabric. This design is also available for Matt O'Neill and 17" Super Hero and 19" Pever Pevensie dolls. The pdf version prints on A4 and 8 1/2 x 14 legal size paper. Notions: 4/0 snap sets for shirt closures and shorts closure, tiny buttons, 2 eyelets and two eyelet washers for swim trunks.